Stability: Stable. Combustible. Incompatible with acids, bases, oxidizing agents. 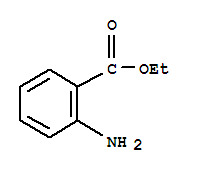 ETHYL ANTHRANILATE may hydrolyze under acidic and basic conditions. ETHYL ANTHRANILATE should be protected from air and light. Insoluble in water. Flash point data for ETHYL ANTHRANILATE are not available. ETHYL ANTHRANILATE is probably combustible. Colorless liquid with a fruity odor. Insoluble in water.